Goodbye, inconvenient, easily forgotten business cards. Hello, smarter modern-day alternative. Late last year I told you about Eyejot Video Mail, an iOS app that allows you to send talking-head messages -- including video business cards -- right from your iPhone. Now the developer has broken out that feature into its own app: Eyejot vCard. With it you can create an electronic business card consisting of a video clip, all your pertinent contact info, and even map data. Next you fill in your name, address, phone numbers, social-media links, and the like. And that's pretty much it. When you want to share your card with someone, you simply tap Send, then enter an email address or phone number (Eyejot vCard supports SMS as well as email). If it's new information (i.e. a person you don't already have in your contact list), the app can automatically add it to your address book. You also have the option of creating a "calendar follow-up event," meaning Eyejot vCard will automatically add a follow-up reminder to your iOS calendar--a really handy feature for folks who work in sales, marketing, and other customer-oriented professions. When you're ready to actually send your card, you can either swipe up or just tap the big Send button again. Eyejot vCard isn't perfect. For one thing, it limits you to a single card--not ideal for users who might want different cards for different occasions. Also, you can't set a different follow-up time for each card you send; there's only a global setting that applies to all cards. 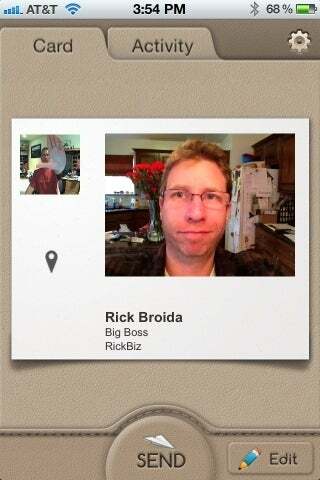 Still, for just 99 cents, this clever app gives you a nifty and memorable alternative to paper business cards. It's definitely worth a look.